Samal Island or Island Garden City of Samal (IGACOS) is one of the seven thousand tropical islands in the Philippines with a larger number of glorious beaches complete with soft white coral sand, rustling coconut palms and gently lapping turquoise water. A number of natural waterways and caves are strategically located within the island. Hagimit Falls is popular to locals and even tourists visiting Davao City. The flowing water coming from the lush forest of Samal is a thing of beauty as it drops to the stream. The effect is very inviting and invigorating. The best part is, there is no need to travel for so long to reach this paradise. Monfort Bat Sanctuary has been the home of a large colony of 2.3 million Rousette fruit bats since recorded history. They cover 75% of theceilings and walls of their 245 ft (75 m)-long cave. The sanctuary is located on Samal Island, about 1 kilometre (0.62 mi) east of Davao City, Philippines. 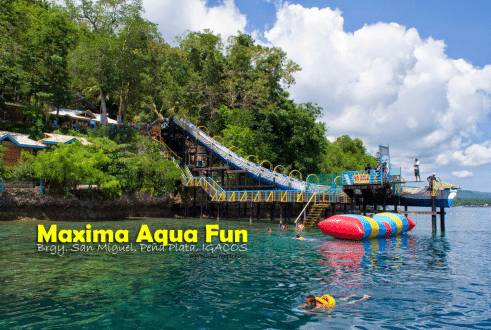 Maxima Aqua Fun Resort has several facilities which any visitor can enjoy. Two Giant Tarpaulin Water Slide. The shoreline of the Paradise Island Park and Beach Resort is about 800 meters of powdery white sand beach, and is the longest in the island. It is the only place in this part of Samal Island that has maintained its shores by periodic cleaning by the so called “Scubasurero” and placed a safety net to ward-off jelly fish, anglers and rubbish, from poaching the area. The beach and its surrounding areas are regularly combed and cleaned throughout the day. Lifeguards can be found throughout the swimming area for the safety of the guests. Spanning across the 14-hectare sea of Barangay Acedor, the Giant Clam Sanctuary is a marine sanctuary with over 3,700 giant clams (genus Tridacna). It is one of the exciting spots to visit in the Island Garden City of Samal. the sanctuary has at least 3,000 mature giant clams. The Giant Clam Sanctuary is a part of a eco-tourism program called “Taklobo Tours”. Click here to book a tour today!